Sometimes I hate the fact that I toyed with being a film studies minor in college because it pretty much removes any ability for me to just take a film at face value. Why can't I just see an animated feature with childlike wonderment and not try to dissect it in some form or fashion? [Tangent: If we are placing blame, I will also dole out a heaping helping of "thank you/no thank you" to my Folk and Fairy Tales course I took in college. Now I can't think about Little Red Riding Hood without considering that the red cloak was somehow a sign of her period. Those three credit hours came with a hefty price...now, I pretty much can't hear a fairy tale without making it somehow about phallus or womanhood or something innately sexual. The Brothers Grimm were some progressive pervs.] Today I went and saw Frozen with my mom and my friend Angi, and the whole time was like, "So Elsa is a lesbian, right? And, this whole movie is about embracing her differences?" It is a truly beautiful moment in the film and made me happy this kind of character exists for all those little gay boys and girls out there. The overarching theme is you are not free from your burdens until you open yourself to love. *I can only hope the ghost of Jerry Falwell doesn't follow this blog. 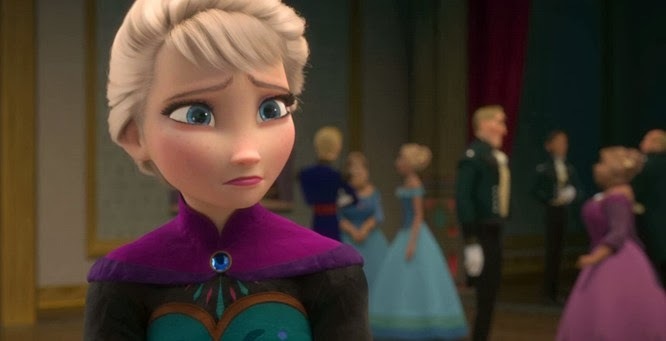 Oh Noes, I haven't seen Frozen yet and can't ready this post yet. I need to get to watching that one ASAP though :) Can't wait. Then I'll come back and read your analysis. I'll be looking for allegories while viewing now! Please do. I love to discuss movies with people. I think it could really speak for any minority group, but the gay angle seemed the most obvious. Powerful analysis here and I will be sharing this post! I have not seen the flick but I tend to identify with characters whose arc involves dealing with their "differences". It's interesting that you should bring up X-Men (and yes, The Last Stand was a stinker, but the rest of them are terrific) because I think what you're seeing with the comic book and animated movies is the creation of a new Mythology for the 21st century. Within the modern pantheon we see such a wide spectrum of "gifts" and "differences" that it becomes easy to find at least one person with whom you can relate. It's wonderful that we are beginning to celebrate differences in sexual orientation. We need to get the ball rolling on getting society to accept and celebrate disabilities. I think it is beginning to happen. It is on the horizon. I thought it was an allegory for mental illness/depression, but I guess that works too. Now I feel like I need to rewatch it with that perspective. I think that could work, too. I kinda felt the "conceal. Don't feel." could work for a myriad of things...reasons why people feel marginalized. Spash, I'd say that such films and comics aren't so much a new mythology as they are a continuation of an ancient tradition that never really died: the telling of epic, mythical stories that often serve as helpful allegories. Kimmie, I have two words for you and a video: gay subtext.